Max Garcia, Cmp’17, helps high school students transition to university life as a residence don. In his new role as Queen’s Student Alumni Association (QSAA) president, he is helping students prepare to graduate from Queen’s and find fulfilling careers. For the past 30 years, the QSAA – which was previously known as STAR (Student Team on Alumni Relations) – has worked closely with the Queen’s University Alumni Association and the Queen’s Alumni Relations to build relationships between students and alumni. Mr. Garcia’s goal for the upcoming academic year can be summed up in one word – transition. He wants to focus on getting students ready for life after Queen’s and giving the soon-to-be graduates their best chance at success in the working world. To help achieve this goal, Mr. Garcia will be working with a team of nine other QSAA executives and 25 student volunteers to organize events to teach students skills that are not regularly taught in a classroom. Some of the activities include the Backpack to Briefcase lecture series which gives students tips on how to write a résumé, use LinkedIn effectively, and do well in a job interview. The QSAA also organizes several alumni talks with prominent and successful graduates, such as GOLD (Gaels of the Last Decade), – a panel discussion of recent grads -- and the Alumni Speaker Events, which bring back high- profile graduates like NASA astronaut Drew Feustel, PhD’95, and Dragons’ Den TV star Michele Romanow, Sc’07, MBA’08. Many alumni will see Mr. Garcia during Homecoming in October when the QSAA hosts Spirit Corner beside Grant Hall. 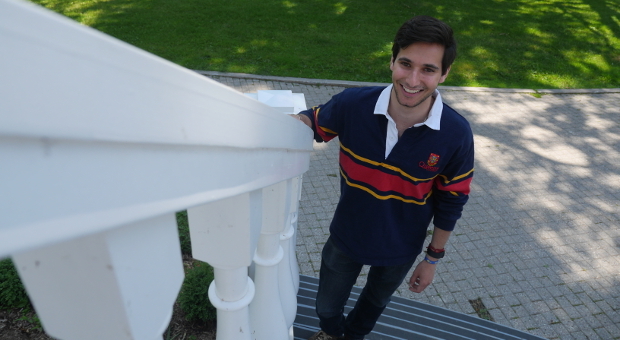 Mr. Garcia – whose brother Rico Garcia, Artsci’13, was QSAA president during the 2012-13 academic year – has a long history of helping Queen’s students. Along with being a residence don, he was also the Media Services Director with the Alma Mater Society and president of Computing Students Association (COMPSA). He wanted to be QSAA president so he can help students and give back to the Queen’s community.